-Cobalt is the most powerful and stable colorant used in glass, glaze, enamel, and even paint. As little as 2 PPM can produce a recognizable tint, thus cobalt is often cut in a medium to make it easier to weigh and distribute in a mix. -Various raw forms are available and all break down to cobaltous oxide (CoO), which is the stable form that combines with the glass melt to produce color. These include black stable cobalto-cobaltic oxide (cobaltosic oxide) Co3O4, which has a 93% conversion ratio and decomposes to liberate oxygen at 800C. Grey cobaltic oxide (Co2O3) is 90% CoO and mauve cobalt carbonate (CoCO3) has 63% effective stain content. Cobalt dioxide (CoO2) is not marketed for ceramics. -Although cobalt has a high melting point by itself, is dissolves readily in most glazes and acts as a powerful flux, especially alkaline and boron types. This active nature causes it to diffuse, making it difficult to maintain a clean edge on painted decoration, especially overglaze. Decorated areas employing color in or on glaze can thus be locally more melted depending on the concentration of CoO or its particle size, this can result in increased tendency to blister or crawl in some glazes. -It is very color dependable under both oxidizing and reducing furnace conditions, fast and slow firing. Cobalt is used in a wide array of decal inks, underglaze colors, glaze and body stains, and colored glazes. It is not volatile even at 1400C. -Cobalt is a trace element in vegetables and an important vitamin (B12) in stock raising. Cobalt metal is used in steel and chrome alloys. In magnesia glazes a color range is from violet to lilac is possible. Cobalt is a classic and reliable blue colorant at all temperatures and in most types of glazes. The shade of blue can, however, be affected in many ways by the presence of different oxides. Cobalt is powerful and often less than 1% will give strong color. If the color needs to be toned down, additions of iron, titanium, rutile and nickel may work. 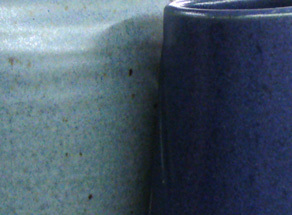 Cobalt is often calcined with alumina and lime for soft underglaze colors. Stains often employ mixes of alumina, cobalt, and zinc for softer blue colors. Cobalt is used in combination with manganese and selenium to mask excess yellow coloration (yellow plus blue gives green which is masked by the pink of selenium). Combinations with iron and manganese can give a slate blue. With barium shades of blue-green are possible. With chrome and manganese blue-black and black are common. With chrome and copper, cobalt can yield tints from pure cobalt blue, to greenish-blue, to the green of chromium. These effects work best when silica is not too high and there is adequate alumina. When cobalt occurs with manganese (i.e. 1-3% cobalt carb, 3-5% manganese carb), purples and violets can be made. Less cobalt will lighten the color. This effect works well in magnesia glazes. In high magnesia glazes, 1-2% cobalt alone will give purple. Add tin to move the color toward lavender. With MgO, SiO2, and B2O3, red, voilet, lavender, and pinks can be made. With adequate SiO2 and high MgO (0.4 molar), purple, violet, lavender, and pinks can be made using 1% or more CoO. Mimimizing boron, alumina, and KNaO will help prevent it from turning blue. Note that the high MgO will generally make the glaze matte and it could suffer some ill effects associated with excessive MgO. If you add an opacifier to this the color will become pastel and lighter and vary less with thickness. All common traditional ceramic base glazes are made from only a dozen elements (plus oxygen). Materials decompose when glazes melt, sourcing these elements in oxide form. The kiln builds the glaze from these, it does not care what material sources what oxide (assuming, of course, that all materials do melt or dissolve completely into the melt to release those oxides). 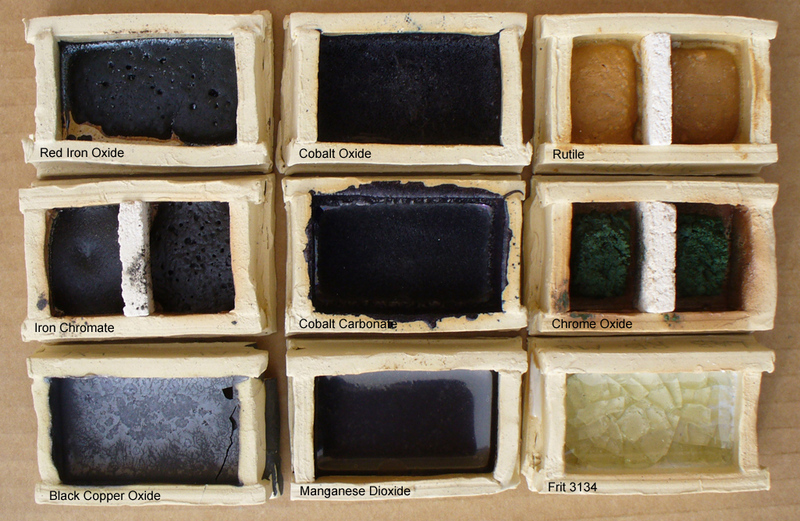 Each of these oxides contributes specific properties to the glass. So, you can look at a formula and make a good prediction of the properties of the fired glaze. And know what specific oxide to increase or decrease to move a property in a given direction (e.g. melting behavior, hardness, durability, thermal expansion, color, gloss, crystallization). And know about how they interact (affecting each other). This is powerful. And it is simpler than looking at glazes as recipes of hundreds of different materials (each sources multiple oxides so adjusting it affects multiple properties). 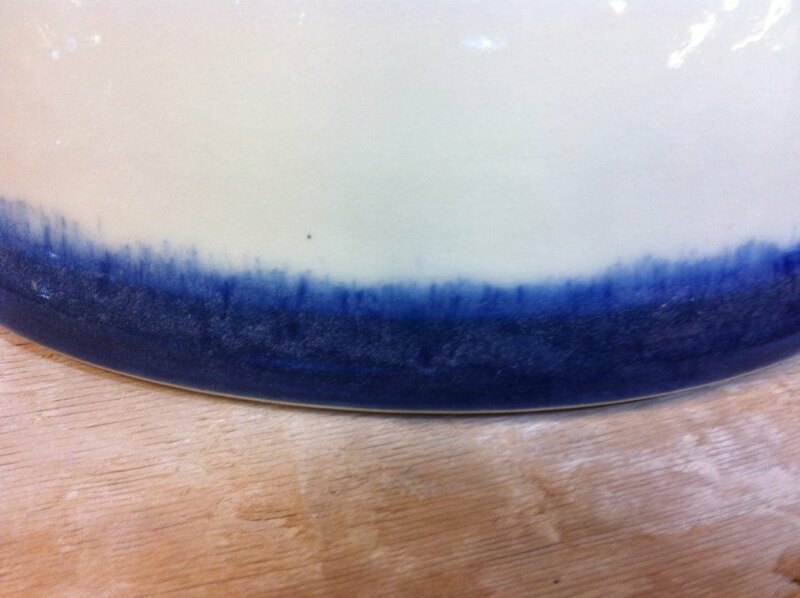 Adding a little blue stain to a medium temperature transparent glaze can give it a more pleasant tone. Some iron is present in all stoneware bodies (and even porcelains), so transparent glazes never fire pure white. At cone 10 reduction they generally exhibit a bluish color (left), whereas at cone 6 they tend toward straw yellow (right). Notice the glaze on the inside of the center mug, it has a 0.1% Mason 6336 blue stain addition; this transforms the appearance to look like a cone 10 glaze (actually, you might consider using a little less, perhaps 0.05%). Blue stain is a better choice than cobalt oxide, the latter will produce fired speckle. 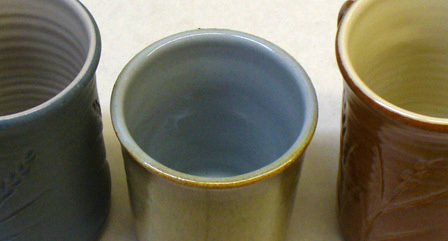 An example of how the same dolomite cobalt blue glaze fires much darker in oxidation than reduction. But the surface character is the same. A different base glaze having the same colorant might fire much more similar. The percentage of colorant can also be a factor in how similar they will appear. The identity of the colorant is important, some are less prone to differences in kiln atmosphere. Color interactions are also a factor. The rule? There is none, it depends on the chemistry of the host glaze, which color and how much there is. Cobalt carbonate (top) and copper carbonate (bottom). 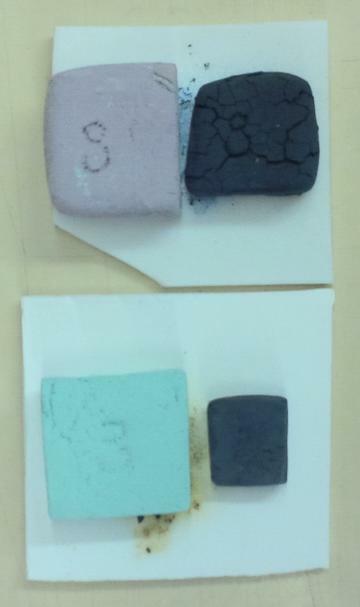 Left is the raw powder plastic-formed into a sample (with 2% veegum). Right: fired to 1850F. The CuCO3 is quickly densifying over the past 100 degrees and should begin to melt soon. It is long past the fuming stage.